I talk to a lot of people while traveling, including stay-at-home parents. These people are fired up! They’re totally focused on their future and want to reach their goals as a husband-and-wife team! But it’s not uncommon for the spouse to ask how they can contribute financially. As a stay-at-home parent, you might think saving for retirement isn’t an option for you. After all, I’ve never seen a kid offer a 401(k) plan, no matter how many hours a parent has spent caring for them. 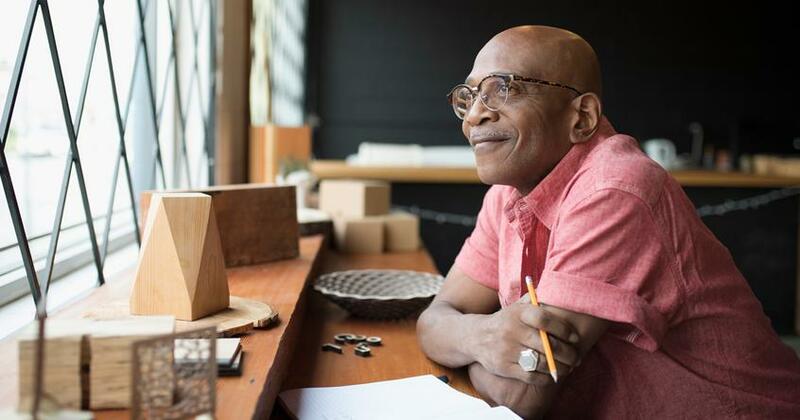 But I’ve got some great news: Just because you aren’t the primary breadwinner doesn’t mean you can’t save for retirement thanks to two magic words—spousal IRA. First, let’s be clear: When you’re married, it’s not his and hers money anymore, folks. It’s our money, and you should be working toward a shared financial dream. But what about the nonworking spouse who wants to feel more empowered about contributing to the financial goal? This isn’t uncommon. Take Rich P. for example, an investing professional in Albany, NY. Rich’s wife has been a stay-at-home mom for 27 years. "I wouldn’t trade it for the world," he says. "The fruit it produces is amazing." But no matter how hard Rich’s wife worked to keep the household running, one concern kept popping up. "My wife would feel like she wasn’t contributing enough," he says. That’s because she was looking at it from a purely financial standpoint. "Even though my wife and I see the money I earn as our money, there’s still some part of her that sees it as money she can’t spend." Rich realized setting up a spousal IRA could help his wife feel more empowered. 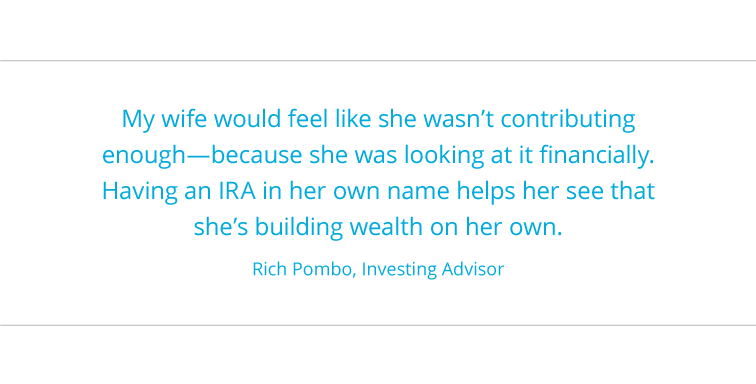 "Having an IRA in her own name helps her see that she’s building her own wealth," he says. Simply put, a spousal IRA enables a stay-at-home husband or wife to set up a retirement account in their own name. As long as one person in your household brings home a paycheck and you file a joint tax return, you’re good to go! When setting up a spousal IRA, you have a choice between a traditional and a Roth IRA. A traditional IRA works much like a 401(k). It’s tax-deferred, which means you don’t pay taxes on the money you invest until you withdraw it. A Roth IRA uses after-tax dollars, so your investment grows tax-free. Any money sitting in a Roth IRA at retirement is all yours. 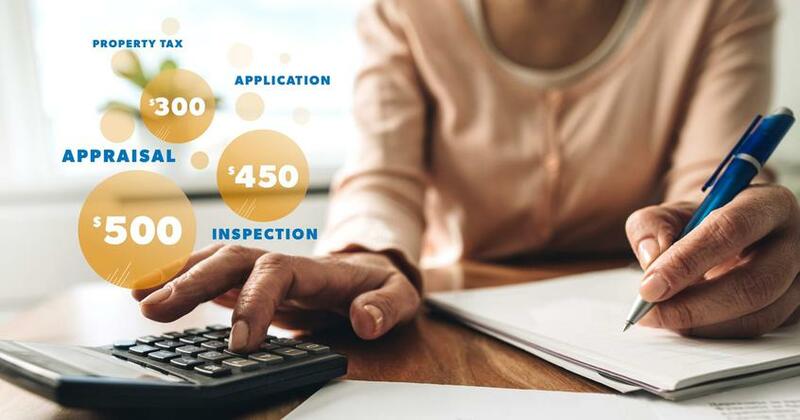 I recommend the Roth option because once you take care of the taxes upfront, you don’t have to worry about them later on—which saves you more money. You can contribute up to $5,500 ($6,500 if you’re 50 or older) to a Roth IRA this year. (1) But there are some income limits—so check with an investing professional to make sure this can work for your situation. Now, where does all this investing money come from if you don’t get paid for all your hard work as a stay-at-home parent? Let’s talk about it. I recommend putting 15% of your total household income toward retirement. If your spouse brings in 100% of your household income, then it’s just a matter of how you allocate that 15%. If your household income is $60,000 a year, you should invest $9,000 a year—or $750 a month—toward retirement for both of you. Here are two ways you could break that investment down. Let’s say Tom works full-time making $60,000, and his wife Jenny stays home to care for their two kids. He gets a 3% match on his 401(k) contributions, and they decide to invest their entire 15% under his name. Tom’s 401(k) is a traditional tax-deferred plan that offers good mutual fund options, so they come back to it after maxing out his Roth IRA. Now let’s see how things would look if Tom and Jenny split their 15% evenly, giving them each 7.5% to invest for retirement. Dividing their retirement investments evenly doesn’t just enable Tom and Jenny to build equal stakes in their future. It also means more of their nest egg is safe from taxes in their golden years. Let’s look at the numbers. 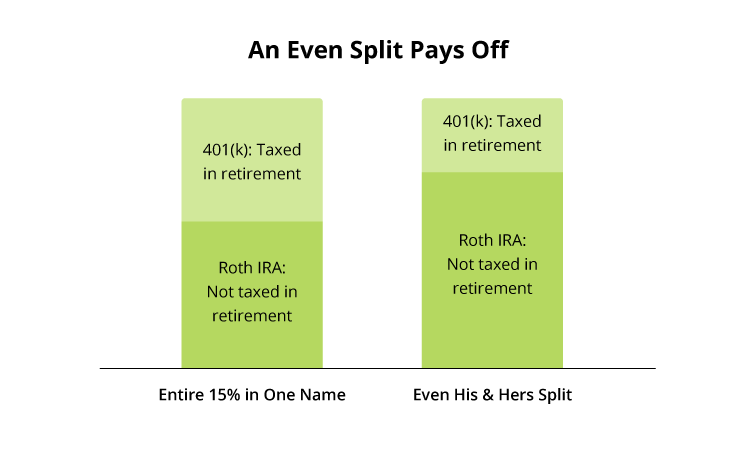 If we compare these two examples side by side, you’ll see that putting all of Tom and Jenny’s retirement cash under one name means nearly twice as much is invested in a 401(k), making it subject to taxes when they withdraw it. But if they have separate Roth IRAs, less of their money will be taxed when it’s withdrawn in retirement. Of course, everyone’s situation is different. Your spouse’s 401(k) might offer a Roth option or have terrible mutual funds to choose from. Or you might have a home-based business, which opens up even more investing possibilities. A good investing professional can help you sort through your options and find a retirement plan that’s right for you. There’s no higher calling on the planet than parenthood. If you work as a stay-at-home parent, you work seven days a week and never leave "the office." 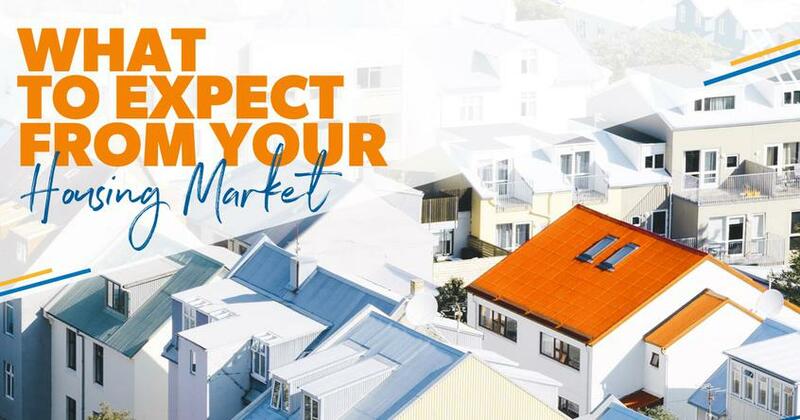 With no paycheck—and often no recognition—it can be easy to lose sight of the tremendous value you bring to your household. I get it. And I want you to know what you’re providing is worth more than a balance in a bank account. Every life lesson you teach and hug you give lays a firm foundation of love for your family. Just don’t let the everyday to-dos keep you from being fully bought in and excited about your financial dream. Want peace of mind for your family and your future? Our SmartVestor program helps you find investing professionals who will help you follow the financial principles I teach. Your investing pro can guide you in creating a plan that turns your hopes and dreams into reality and puts your fears and challenges to rest. But remember, your retirement is up to you! Find a SmartVestor Pro today! Chris Hogan is a #1 national best-selling author, dynamic speaker, and financial expert. For more than a decade, Hogan has served at Ramsey Solutions, spreading a message of hope to audiences across the country as a financial coach and Ramsey Personality. Hogan challenges and equips people to take control of their money and reach their financial goals through national TV appearances, The Chris Hogan Show, and live events across the nation. His second book, Everyday Millionaires: How Ordinary People Built Extraordinary Wealth—And How You Can Too, is based on the largest study of millionaires ever conducted. You can follow Hogan on Twitter and Instagram at @ChrisHogan360 and online at chrishogan360.com or facebook.com/chrishogan360. What Is the Thrift Savings Plan and How Does It Work? 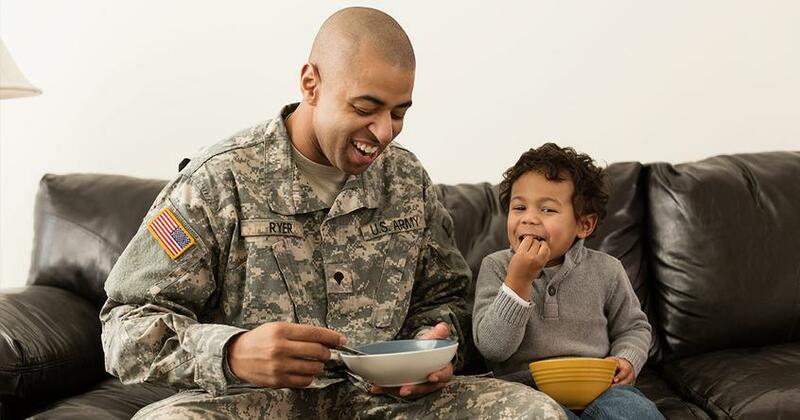 How does the Thrift Savings Plan (TSP) fit into your retirement planning? Here's how to make it work for you.